I admit it. I don’t get very excited about bananas. Sure, I eat at least one a day, usually sliced and put on top of my morning oatmeal. I feel it’s my duty to my body. Now. Having said that…bananas do get a little exciting when you do something with them – frozen and added to a smoothie, for instance, or blended into tofu pudding, or mashed and added to muffin batter, or – the best way of all – caramelized. The flavor takes on a whole new rich and decadent dimension. Roasting brings out the tropical in the banana. Which is what makes these simple cakes so delicious. I put these together as I was making lunch yesterday so that they’d be finished in time for us to have with our post-lunch latte (Kel) and Choffy (me). And, the recipe can be easily doubled in case you have more mouths to feed. Mouths that either love or just kinda like bananas. Hey, it’s your duty to get your daily banana! 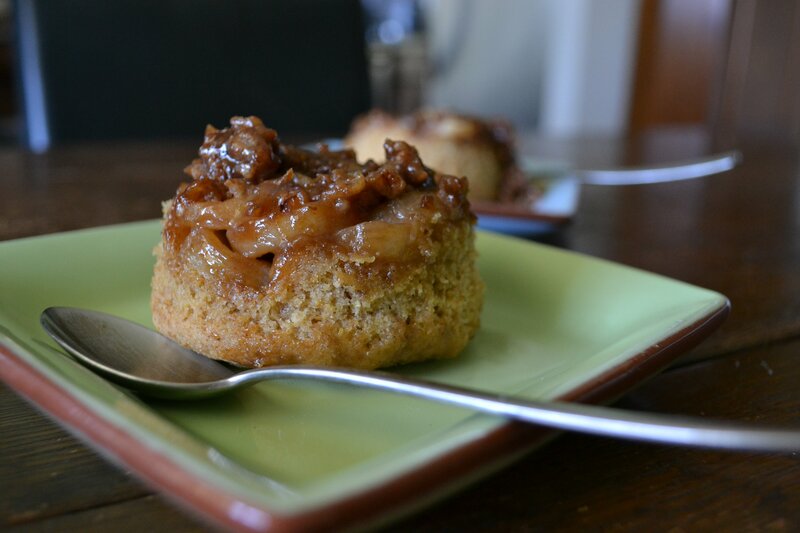 Sweet little cakes for two that bake up while you eat lunch or dinner. In a small microwave-safe measuring cup, melt 1 tablespoon of the “butter.” Stir in the prune puree and divide the mixture between two ramekins. Sprinkle with pecans and then layer the banana slices over the pecans. In a small bowl, whisk together the flour, baking powder, cardamom and the pinch of salt. In another small bowl, cream together the remaining tablespoon of “butter” and the maple sugar. Add the flaxseed meal mixture and vanilla and whisk until well combined. Stir in the flour mixture and beat until just combined. Divide the batter between the two ramekins and bake for about 25 minutes. Run a sharp knife around the edges of the ramekins, then carefully invert the cakes onto plates. Looks ooey-gooey good. I really like your green plate! I have a weakness for that shade of green! Those look awesome! I admit I am a giant banana fan – loving them mostly in smoothie, but also occasionally on my peanut butter toast or sliced down the center and laden with almond butter 🙂 I love that this recipe makes only 2! No waste or feeling like you *have* to eat another one (hehe) – so awesome! I do love them on my PB toast as well. And yes, very safe to only make 2! And a small size at that. oooo fancy cakes 😛 I am super picky about bananas no bruises/ brown spots lol every time you post something yummy I want to try it 🙁 then it reminds me that I am broke in college and starving half the time lol! I wonder how this would taste with cherries or blueberries 😀 I have those on hand. Awesome post! You are such a talented baker! These look simply decadent! No offense taken! I’d be happy to send you the original recipe, if you like. Unveganized ;-)! These look great (As is- no “unveganizing” needed! ), but I’m allergic to bananas. I’ve read online that many people who share my allergy don’t have any problem with cooked/baked bananas… so many I’ll give them a try! Oh my gosh! Allergic to bananas – yikes! Interesting that cooking them might eliminate the problem. I think I’d be scared to try! These look fabulous! DO you think I could suba real egg for the flax egg? I love your Choffy desserts! Thanks for sharing. I am an independent Choffy distributor putting together a page of Choffy recipes. The page links out to your site (it does not contain your content). May I please use one of your Choffy recipe photos as the featured image on my page? I’m open to your thoughts on attribution credit and cost. Hi Sid – let me know which photo you’re interested in and I can send you a copy. All I ask is that you give me credit for the photo w/ my name (Annie Oliverio), the blog name (An Unrefined Vegan) with a link back to my site – either to the recipe or my site in general. If you can, it would be great to have the photo take viewers to my site as well if they click on it. Thanks for your interest – – and I love Choffy :-)!